Leaders express solidarity with Argentina's historic claim to the Malvinas/Falkland Islands. 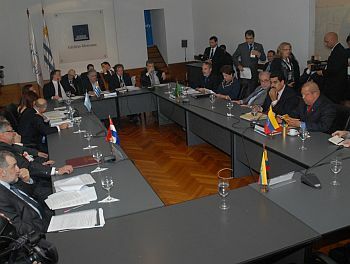 MONTEVIDEO, Dec 21, 2011 (IPS) - The leaders of South America's Mercosur trade bloc decided to set up a committee to facilitate the incorporation of new members, adopt a mechanism to defend democracy in case of a coup, and ban vessels from the Malvinas/Falkland Islands from docking in member countries' ports. At Tuesday's summit, the presidents of Argentina, Brazil, Paraguay and Uruguay also signed a free trade agreement with Palestine, seen as mainly symbolic, and expanded the list of products from outside the bloc that will pay import tariffs. In their speeches, the Mercosur (Southern Common Market) leaders acknowledged the contradictions and hurdles faced by the region's largest trade bloc, while stressing the need to continue to forge ahead with the process of integration. At the bloc's headquarters in Montevideo, host President José Mujica met Cristina Fernández of Argentina, Dilma Rousseff of Brazil and Fernando Lugo of Paraguay, as well as Hugo Chávez of Venezuela and Rafael Correa of Ecuador, whose countries are in the process of joining as full members. "Our path is full of contradictions and difficulties," Mujica said. "Woe to us if the contradictions disillusion us and we abandon this project. We would soon become a leaf in the wind, in this world of colossal forces." The Uruguayan president emphasised that the bloc represents not only economic, but political, integration. "Without politics, there will be no Mercosur in the long run, and there will be no convergence, because this is not only an economic equation. "Alas for us if we fail to understand that the underlying issue is a question of power, and that this question makes it necessary to move towards convergence," he said. Mujica also confirmed the creation of a high-level committee to analyse the admission of Venezuela and Ecuador as full members. Venezuela, whose admission process began in 2006, is only awaiting approval by the Paraguayan Congress, where legislators opposed to the left-leaning Lugo hold a majority. For its part, Ecuador formally requested full membership on Tuesday. Chávez said the incorporation of his country as a fifth full member has been blocked "by just five lawmakers" in Paraguay. "These people who have been opposing (Venezuela's admission) for five years, I don't know if they are aware of the harm they are causing, not to Venezuela, but to everyone, to the Paraguayan people themselves," he said. "There are only five people who don't want it. I think that behind them there must be a very powerful hand, moving who knows what mechanisms of pressure," he maintained. Chávez underlined that Venezuela's incorporation would mean "opening Mercosur to the Pacific. "We are members of OPEC (Organisation of Petroleum Exporting Companies), we have gas and energy reserves, we have things to contribute," he added. "We have to expedite this, spurred on by the global crisis that is threatening us." Lugo also referred to the case of Venezuela and the resistance put up by a handful of legislators in his country. "This government of Paraguay is respectful of its institutions, but it is making an effort to strengthen integration. The incorporation of Ecuador and Venezuela would work in favour of our bloc," he said. Rousseff, meanwhile, highlighted the agreement reached at the summit "to expand the list of products included in the common foreign tariff" applied to imports from outside Mercosur, and to adopt various mechanisms to foment intra-bloc trade. Correa, for his part, stressed the signing of the "Montevideo Protocol", a mechanism providing for a mutual response in defence of democratic institutions in case of a coup d'etat in any of the member countries. The summit agenda, which was to include public ceremonies, such as the signing of the agreement with Palestine – signed in private in the end – was interrupted by the tragic news of the death of Argentina's deputy trade secretary, 33-year-old Iván Heyn. The newly appointed official was found hanged in his room in the Montevideo hotel where most of the Argentine delegation was staying. The police said his death appeared to be a suicide, but that the investigation continued. When Fernández was notified, she was so upset that her private doctor was called to attend to her. The summit also approved a resolution to close the bloc's ports to vessels flying the Falkland Islands flag. The islands, known as the Malvinas in Argentina, have been held by Britain since the 1830s, and were the subject of a brief war between the two countries in 1982, when Argentina sought to assert its sovereignty over them. In a column posted on the Uruguayan president's web site Tuesday, Mujica explained his decision to ban the boats from docking in Uruguay, arguing that his country's foreign policy has always been based on national interests, but also on the principle of solidarity with the region. Mujica said solidarity with Buenos Aires also benefited Montevideo. "Uruguay's political history shows that every time relations with Argentina have soured, the economy and labour have been enormously impaired," he wrote. Fernández expressed her appreciation for the member countries' decision to block boats from the Malvinas. The Malvinas "are not just an Argentine cause, but a global cause, because (the British) are taking oil and fishing resources, and when they need more resources, whoever is the strongest will go to find them whenever and however," she said, as Rousseff nodded. "When they sign something involving the Malvinas, they are doing so as if the Malvinas belonged to them. There are many countries here with great natural wealth, and this wealth must be defended. Let's be smart enough to understand that, by taking care of each other, we are taking care of ourselves," she added. Is time for Argentina to go the next step and isolate the British from the rest of america and the world , 12500 km away from their land . And sit tight and wait until invaders change mind and start a negotiation . Las Malvinas are Argentine and we mean it at any price.